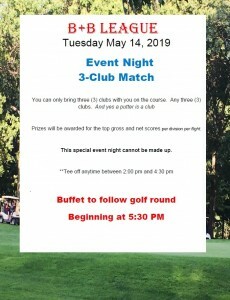 The B+B League is a social golf league that plays every Tuesday at St. Anne CC from April through September. The B+B League is a mixed league open to any and all golfers. 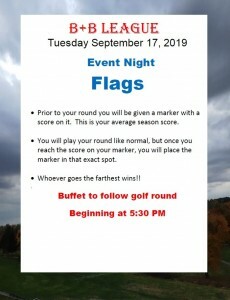 We have monthly events nights with a unique format followed by a buffet dinner. If you would like to join The B+B League, stop by The Pro Shop at St. Anne CC and pay the dues. The cost for the B+B League is $60.00. Dues are to be paid no later than April 1, 2019. 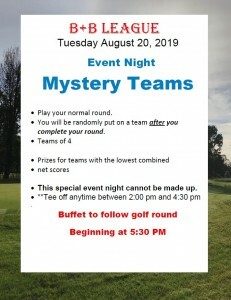 Included in the league fee: Local handicaps, 5 special events with prizes and a buffet, awards dinner on the Field Day. What is not included are greens fees and cart rentals. There is an additional fee of $25.00 to participate in the field day. The B+B League has the tee from 3:00 pm until 4:20 pm. There are 2 Leagues that will follow the B+B League at 4:30. 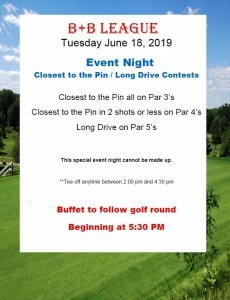 All players from the B+B League must be off the tee by 4:20 pm. Each week you will play a different person within your division. Your score will be determined based on your head to head play by hole with your handicap. You do not need to play with your opponent, you just need to record your score and turn it in to the pro shop. Each hole will be worth 1 point, if the hole is tied then the point will be split ½ each. The total available points for the 9 holes will be 9 points. The most points a player can win each week is 9 points. The league consists of 26 weeks. The first week is to determine flight placement. Then, 25 weeks of head to head competition, including 5 special events played against all players in the league. **Special Event Nights will count as regular matches and points will be given to winners. In the event that you cannot play on the scheduled league day, you have 2 options. 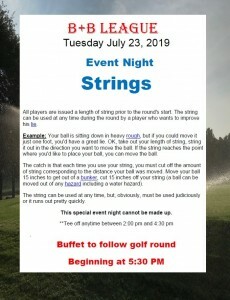 You can have a substitute player (with a verifiable Handicap) play your round or you can do a make-up round, on or before the following Monday. If you do neither of these options you forfeit the round and your opponent will play the league average score as determine by the League Manager software program. *Special Event Nights cannot be made up and must be played on the scheduled day.